The Chronicles of Riddick: Assault on Dark Athena might have been a purely single player affair, if not for the begging of a large, muscle-bound bald man. Speaking with G4's All Access, Vin talks about his gaming history for a bit before discussing his lastest run as Riddick in The Chronicles of Riddick: Assault on Dark Athena. Apparently the game was being developed without online, but Diesel pleaded with developer Starbreeze, which resulting in them adding some compelling multiplayer modes to an already compelling game. 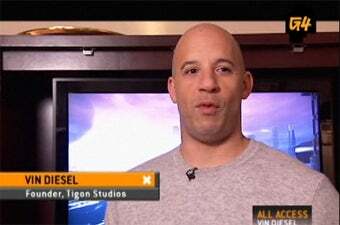 Check out the full segment below, while I try to imagine Vin Diesel begging. I bet it involved knives.